Samsung partially showcased its foldable phone at its Developer Conference in November last year and a limited number of people got to experience it at this year’s CES. However, the company didn’t really dole out the official announcement date of the device, but it has now announced that it will showcase its foldable phone on February 20 at the Galaxy Unpacked event, alongside the Samsung Galaxy S10 lineup. The announcement comes via the company’s official Twitter account where it posted a teaser video, which is clearly an intimation about the Galaxy F's launch. The caption of the tweet reads, “The future of mobile will unfold on February 20, 2019,” which is also a nod at the device’s impending launch. From what we know so far, Samsung's foldable phone could be called the Galaxy Fold or Galaxy Flex. It will feature two displays, one of which is rumoured to be larger with a 7.3-inch screen, 1536x2152p resolution and 420 dpi. The other one might be 4.58-inch in size with 840x1960p resolution and the same screen density. The larger display is slated to feature a 4.2:3 display aspect ratio while the smaller one might have a 21:9 display aspect ratio. 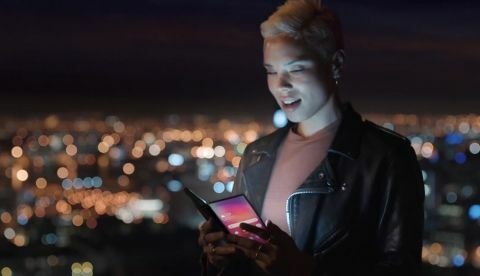 Samsung recently outed a video under its new campaign to “kick off a year that will both celebrate the 10th anniversary of Galaxy smartphones and set the foundation for the next decade of new, innovative and groundbreaking products.” in this video, the company showcased a slew of futuristic tech but the one that caught our eye was a short glimpse of the foldable phone.